A series of scandals in Australia’s financial sector in recent years have prompted high profile parliamentary and other public inquiries about how to counter corporate wrongdoing. In particular, as to the capability of the Australian Securities and Investments Commission (ASIC) to counter such wrongdoing and the effectiveness of penalties regimes available to ASIC. 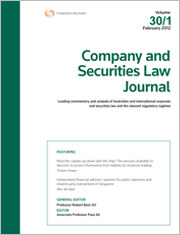 This article contributes to current debates about regulating Australia’s financial services sector by examining enforcement under the Corporations Act 2001 (Cth) through the lens of a study of court-based enforcement by ASIC of financial services misconduct for the period 1 July 2011 to 30 June 2014. This empirical snapshot of court-based enforcement suggests that penalties applied by courts are cautiously applied and that increases in the size and range of penalties available do not guarantee their subsequent application and use by courts. These findings have important implications for any future reviews of ASIC’s penalties regimes and enforcement practices. In the wake of a string of high profile financial scandals and the Australian Securities and Investments Commission’s (ASIC) mixed track record in some highly publicised cases, it is not surprising that ASIC has been subjected to increasing public scrutiny. Yet, because of the government’s commitment to balance the Budget, this has meant that public authorities like ASIC have been put under intense funding pressure. The purpose of this article is to consider whether the current enforcement options that ASIC has in its “tool kit” are adequate for it to be an effective corporate and financial services regulator. In particular, it will examine the use of civil settlements and enforceable undertakings, as well as what are known in the literature as “deferred prosecution agreements”. It will be argued that these “new” tools allow ASIC to not only enhance its enforcement capability, but also achieve “justice”. This is especially so if the overarching philosophy guiding their use is grounded in the restorative/preventive (rather than retributive) justice paradigm. In this way, settlements, enforceable undertakings and deferred prosecution agreements can harness the potential to change the organisational/corporate cultures that produced the wrongdoing in the first place. However, to close gaps in ASIC’s armoury, it will also be argued that ASIC should be equipped with additional remedies and powers available overseas. These include “disgorgement” penalties and the power to ban certain retail products. The Australian Sports Commission’s 2015 “Governance Reform in Sport” Discussion Paper proposes to limit voting by members of a National Sporting Organisation to essentially the minimal set of issues required by the Corporations Act 2001 (Cth), and to further mandate the voting rule to be adopted for each issue. The authors critique the Discussion Paper and argue that three issues require discussion to decide which voting rules to implement – the efficiency of the proposed voting rules, the efficiency of mandatory rules in corporate governance regulation and the balance of power between members and directors. They argue that constitutional voting rules ought to minimise the sum of the decision-making costs and the external costs of the issue to be determined. These two costs of voting depend upon the nature of the issue itself and crucially, upon the identity, the number and the preference heterogeneity of the voting members. There is no ex ante reason to assume that a simple majority or any other mandatory voting rule is optimal. For the PDF version of the table of contents, click here: Westlaw AU – C&SLJ Vol 34 No 5 Contents or here: Checkpoint – C&SLJ Vol 34 No 5 Contents.